Manyfolks lie awake at night fretting about paying down the mortgage, reducingtheir credit card debt, hanging onto their job and other mundane matters. Whatis keeping me awake these nights is the giant smallmouth I lost in the firstmajor tournament of the season this past weekend. It was a veritable monster. The likes of which I have not seen in thepast half century of fishing and will unlikely ever see again. It has haunted my every walking moment since. Myfishing partner, Dean McDonald and I fished the (Lake of the Woods) Shoal LakeSpring Classic this past weekend and after weighing in a 16-pound, fivesmallmouth limit on Day 1, we were in 15th place, about a pound-and-a-half outof the lead. Thatis a significant amount of weight in a smallmouth event, where positions are oftenseparated by ounces, but it wasn't insurmountable. Asa result, on Sunday, we reckoned if we were going to win the tournament, whichwe've come close to doing several times in the past, we needed to throw cautionto the wind, go out and do nothing but fish big fish tactics on big fishspots. So,greeted with hot, muggy, flat calm conditions we started fishing at a favouritespot close to take off where there were so many mayflies hatching it lookedlike a snowstorm. We were throwing bigRapala X-Rap Walk topwater lures and within a few minutes I nailed a 3.25-pounder to start the day, followed byanother bass close to 3-pounds. Withour game plan appearing to be working, we took off for some deep main lakebedding bass we knew most of the other anglers would miss. Indeed, they were so remote and tough tospot, we intentionally left them alone on Day 1, hoping no one else would findthem, so we'd have some "fast" and "easy" fish to catch onDay 2. Ourplan worked to perfection. Not only werethe males on the nest, but some big females were also feeding nearby. In short order Dean and I managed to catchfour nice smallmouth before lighting off for a nearby shoal where last year Icaught a 4.65 pound smallmouth that won us $1000 for big fish of the tournament. As a matter of fact, we call it "Four PounderIsland." Andwouldn't you know it, on my first cast with the X-Rap Walk I nailed a 3.5-poundsmallmouth. We then caught a bunch of 2.5to 2.75-pound bass that were fun but not the size we needed to win. So we left a school of hungry fish withnearly 16-pounds in the livewell. Wehit a couple of other primary points adjacent to spawning areas and caughtseveral nice smallmouth, but again, none of the fish were big enough to cull. Sowe kept moving - looking for bigger bass. Thatis when we arrived at a rock pile that has been good to us in the past. And it was good once again. On my third cast walking the topwater, I gotblasted by a smallmouth and as I was bringing in the fish, I noticed there areat least five other like-size bass buzzing around it. Thatis when, believe it or not, I watched bug-eyed as one of the trailers slammedinto the bass I had already hooked and nailed itself to the lure. So, I now hadtwo 3.5-pound smallies on the line at the same time. One of each treble hook. Unfortunately, the fish were tugging inopposite directions, against one other, trying to jump, so the first fishpulled off before we were able to get the duo under control and into the net. Whichbrings us to the point where the story gets interesting. With45 minutes left before we had to weigh in, we decided to swing for the fenceand hit the one big fish spot that has been so good to us in the past. Pulling onto it with less than 30 minutesleft to fish, I threw out the topwater lure, walked-the-dog with it maybe fivefeet and watched as all hell broke loose. Therewas such an explosion on the surface that I yelled to Dean ... "no,no, no don't worry with the net. It isway too big. It has to be a big northernpike." Thatis when I put pressure on the line to quickly bring in the pike and the fishexploded into the air like a tarpon. Itwas a smallmouth bass so huge that Dean and I both looked at each other for atleast two seconds before it finally registered! Iknow the first word out of my mouth was "Holly" and the second wordwas entirely unprintable. The rest of the sentence was ... "it's abass!" So,I fight the fish like there is $14,000 on the line, plus another $1000 for bigfish of the tournament until I have it alongside the boat. That is when Dean sticks the net into thewater, getting ready to scoop it up as I bring it to the surface. Only the bass streaks off to the side, snagsthe front hook on the only broadleaf cabbage stalk in the vicinity and pullsoff. 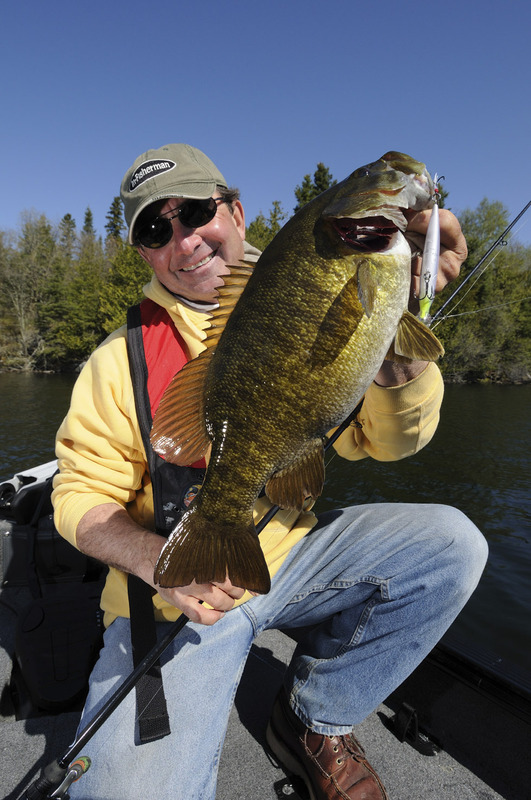 Now,trust me, I've landed several 5-pound plus smallmouth in Lake Erie and my twopersonal best, 6-pound smallmouth in Lake Simcoe.This bruiserwas bigger. Undoubtedly thebiggest smallmouth I have ever seen. Losingit cost us $15,000 - $14,000 for first place and $1000 for big fish ... but Iwould have gladly traded all the money just to have held the fish in my hands,kissed her and taken a photo. Itgets even better: we finished in 13th position ... 2/100ths of a pound out ofthe Top 12 money positions. But,hallelujah, the tournament presents a beautiful LUND boat every year to the 13th place team. Exceptfor this year, which was the 20th anniversary of the tournament, when theypresented the boat to the 20th place team! So... no win, no big fish prize, no LUNDboat and no smallmouth of a lifetime! Andyou think you have problems sleeping because you can't pay the mortgage!